I like it more as a jacketing than for suit. It is nice though. you going to get it in an odd jacket? Well, order is in. Fitting Wed after next in D.C.
Scabal will be in the usual 3 pc., 2 button I usually get. The H&S linen I'm going max summertime mode with a 2pc, flat front trousers, 1/2 lined. Also some horn buttons so I can use the jacket and trousers as separates. Getting this for my trip to Dubai in March. Harris Tweed via Harris Tweed Hebrides. I'm old enough to remember female primary school teachers who use to wear Harris tweed skirts all year round. Most of them had come of age just after WWII. What is the first H.tooth? That London Lounge one? Picked up my custom navy trousers made for braces (worked out well....my first pair from this tailor). Placed another order for an identical pair in dark gray. Might post pics when l have my I.T man show me how to do it. Also ordered two bespoke shirts from my shirtmaker. I need to find someone I can call 'my shirt maker'. I'm actually in the same prison down under as fxh, but we're in different gangs. They managed to these cut, basted and over to the States in 10 days. How long you been growing that moustache. It’s not Movember yet. What colour is that, French Blue? Nice pair of Adelaides too. Who are the maker? I have to be honest, I got a second suit just because I liked the color so much when I was looking at swatches I was really there to order a mid blue linen. It's pretty close to French blue, but actually got some green in it, the camera makes it look a lot brighter than it is. Doing my tweed research for a bespoke tweed coat. Currently looking at this thread for inspiration. Likely to get either an olive herringbone tweed or a brownish or reddish gunclub check or houndstooth. Even a dark brown donegal tweed could be good. A heavy fabric and likely a rough tweed. Next year is the year of tweed commissions with various type of tweed used for coats and dark donegal tweed trousers on the list. I love tweed very much. After much research l have been trying to come up with a smart casual shirt to be worn untucked in hot weather. 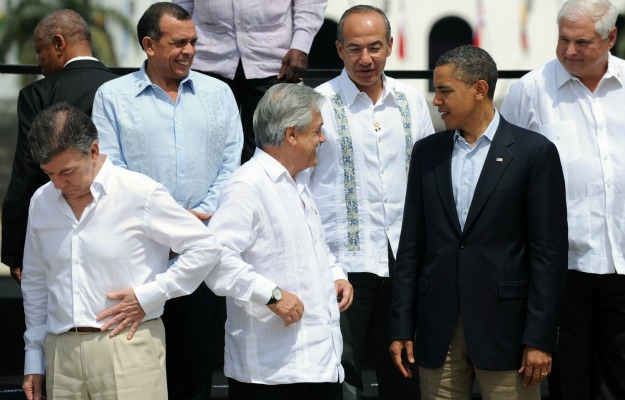 I have decided on the Guayabera cuban style shirt. It is much smarter than a polo shirt. 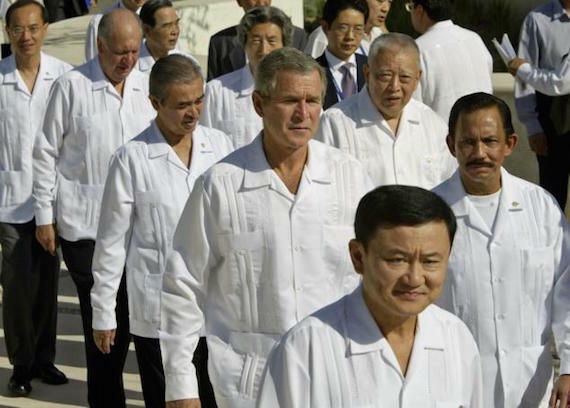 The trick is to get my shirtmaker to make one like George Bush's with the same pleats and collar, but with the embroidery of the guy behind Obama. He has never made them before but i'll put in my first order for 2 shirts next week to see how they work out. I haven't had bespoke shirts in many years and forgot how good they were. After getting lazy l just made do with rtw shirts, but I got sick of them and never really liked wearing them except for the German made seidensticker (top range) because none really felt comfortable and the cut of the collars never sat right with an open necked shirt. I've had all types of shirts ranging from Mason Ward to Turnbull & Asser and Isaia and Borrelli, but the recent fabrics on my new bespokes trump them all. It is very fine Italian fabric that is the most luxurious l have felt and worn. It feels like fine silk. The new shirts remind me of the old days, they are completely comfortable and a pleasure to wear again. The one thing l really do need bespoke is shirts because rtw just doesn't work or look good for various reasons. Trousers are another thing where rtw usually doesn't work well for many reasons, and they usually look bad these days because most trousers are so narrow at the leg and unsuitable for certain leg types like me. Hopefully some pics before the new year. Seeing my tech guy in coming weeks. Pics man, we need pics. never really liked wearing them except for the German made seidensticker (top range) because none really felt comfortable and the cut of the collars never sat right with an open necked shirt. So is there anything you like about them besides the fit? Asking because here they are considered a low end mall brand with cheap made in Vietnam Shirts with lots of ghastly non-iron fabrics, so maybe I am missing out on something? It's a real drag trying to post pics of me wearing stuff, but yeah, pics are definitely better than no pics. I am seeing my tech guy next week so l should be able to post some soon. I've had lots of various makes of shirt, but l never considered them low end. The styling is excellent and the materials are decent too with a price point of about $200. It's interesting how many shirts are sold in highend stores that are made offshore. 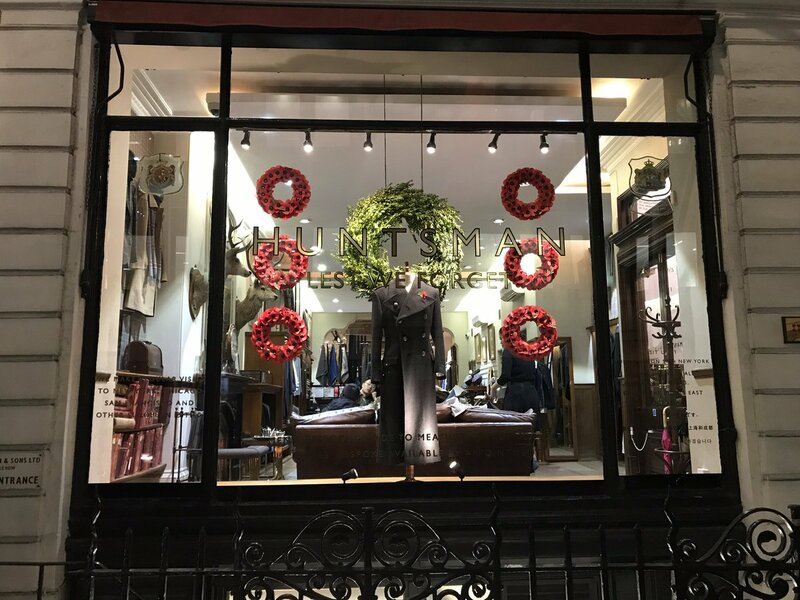 Finding shirts made in England or Australia is difficult now, and even made-in-Italy shirts are not so common due to the high prices. Makes me appreciate my made-in-Oz bespoke shirts, and l really appreciate the makers who still make shirts in those countries like ltaly and England etc. I don't really want to buy made-in-China/Vietnam/Turkey etc. I like the old romance and rareness of supporting those remaining companies that haven't sold/manufactured offshore, but the quality needs to be there. It's easy for traditional manufacturers to move offshore, but who wants to support that type of thing. I was a bit imprecise, they are at the higher end for regular deparment store RTW with about 70€ for the most expensive ones. But they are considered low end when considering all the RTW shirts available in dedicated stores. They do have another more expensive brand called Jacques Britt (spelled something like that), which is their "luxury" brand. I believe they also own the offshore factories they use, so at least quality should be consistent. Guess it is difficult in Australia, with less brands available and everything being so much more expensive. I very much agree with the romance and rareness part of your statement. My shirtmaker told me he can make beautiful versions of those shirts in classic high quality 3 ply light weight cotton fabrics. I have decided to skip the embroidery because it could cost several hundred per shirt for that alone, and l don't want to pay that much for a summer casual shirt, so l am going to order a high quality version of the Guayabera in stunning fabrics without the embroidery. I'll get two to start with, one in light blue and one in white. Back of the shirts will look like this, and i'll get the same style as that of George Bush, but much better fitted of course. That will make a good summer look with light coloured linen pants and tan shoes for casual wear. I've got a real vintage guayabera, I save for special occasions in the summer. Namely when it's 10,000 degrees out. Shooey you've been seeing your tech guy next week for the past five years. No more catfishing please. Have always wanted to try this bloke. Big bucks of course, but looks to be well worth it by looking at these pics. Worth getting it done right. Shooey -is that Charles in Crossley Lane? I didn't think he was very active anymore. Be interesting to hear what the blokes at AT have got to say about him. They are just shirts man!!! Huntsman is trading on its name to a large extent. I like what they do but its not what it seems. Their cutters could never dream of charging such prices on their own pedigree. They don't even cut a Huntsman jacket anymore (what I believe is sometimes called an equestrian cut jacket), instead they do a middle of the road SR military style albeit with one button (not that English military is a bad thing) per se. Its not surprising I guess as all their cutters trained elsewhere so after turning up at Huntsman just do what they already know. Its a place for Russian and less so Chinese oligarchy and their offspring, as well as their core clientele of older American corporate multimillionaire / billionaire. The Ready to Wear is something to steer clear off. Its well made, but has a rather fashion forward cut eg low slung trousers, priced near what bespoke would cost at some other West End tailors bespoke. Well, that's been said for sometime. "Richard Anderson is more Huntsman than Huntsman" "if you want Huntsman go to Anderson not Huntsman" and so on. I would have hought that they cut from the Huntsman block however, which has captured the house style. Maybe our resident tailor scherensammler can help us there. For what it matters, I've never been a fan of the Huntsman cut. The shoulders don't 'work' for me. The rumours are correct. From what I've been told by someone who briefly worked there as a cutter, each cutter does his own thing and it's now closer to RTW look. They also suffer greatly from poor quality management. Most of the cutters are young boys with very little authority over the tailors. So they have different sleeve pitches, different final measurements (even different make quality) for the same customer even when the jackets were made by the same tailor. Interesting. A lack of experienced cutters. This skills gap is endemic across manufacturing of all stripes in Britain. My generation should now be stepping into the shoes vacated by the baby boomer generation, but they hardly trained anyone so no we have millennials stepping in, who, whilst talented (in some cases) lack experience. You should post more about tailoring. You're a font of knowledge.